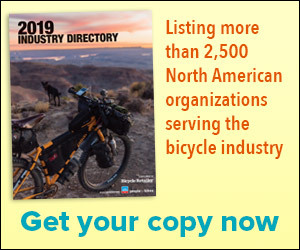 WASHINGTON (BRAIN) — Pacific Cycle is working with the U.S. Consumer Product Safety Commission to recall about 17,600 Schwinn mountain bikes because the bikes' frames can crack. TAIPEI, Taiwan (Sponsored) —"Air Fom has designed a product that can be installed at your local IBD, delivers an excellent dynamic ride, is lightweight, is competitively priced, and most importantly, completely eliminates flat tires," says Mark Peterman, the founder of Air Fom. WASHINGTON (BRAIN) — Canyon Bicycles is working with the U.S. Consumer Product Safety Commission to recall about 820 mountain bikes because the chainstays can crack. CHICO, Calif. (BRAIN) — Paul Component Engineering is now offering its Boxcar aluminum stem in a size to fit 35 millimeter handlebars. The stem is initially available only in a 35mm length, as well. A 50mm version will be available soon. IRVINE, Calif. (BRAIN) — Lazer Sport NV is recalling some sizes of helmet models sold in the U.S. and Canada since 2015. ASHEVILLE, N.C. (BRAIN) — Industry Nine has signed a licensing agreement with Shimano to offer Micro Spline-compatible freehubs for use with the new XTR M9100 12-speed mountain group. All the freehubs will be produced at I9’s facility in Asheville, and will be available by the end of the year. TAICHUNG, Taiwan (BRAIN) — U.S.-based business development firm Lucidity unveiled a new quick release thru axle design that can be easily retrofit to most current thru axle frames and forks. It offers quick wheel removal and installation as well as improved safety, the company said. WASHINGTON (BRAIN) — Trek Bicycle has been granted a utility patent on the technology behind its IsoSpeed feature, an adjustable compliance system incorporated into some of the company's road, gravel, cyclocross and mountain bike frames.